Background: The resignation comes at the end of a week of extraordinary events that began with the military moving in last week, angered by Mugabe's firing of his longtime deputy and the positioning of the unpopular first lady to succeed him. Impeachment allegations against Mugabe included that he "allowed his wife to usurp constitutional power" and that he is "of advanced age" and too incapacitated to rule. Mugabe also was accused of allowing first lady Grace Mugabe to threaten to kill the recently fired Vice President Emmerson Mnangagwa and other officials. Well if he's a communist and a racist like Mugabe it hardly matters. The country will remain a basket case. 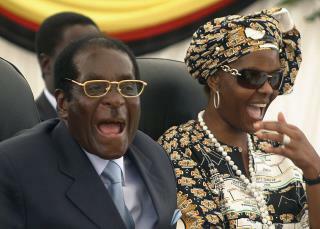 Frying pan into the fire, wake up Zimbabwe, there is a reason why this man is called the "Crocodile"! Boys and girls, what do crocodiles do?